Fall turkeys are much more vocal than most folks assume. Sure, they aren’t gobbling their heads off like spring birds, but in general, they are pretty chatty. You need to be where they want to be, however, which requires a bit of scouting. This is something I did earlier this month on a farm near my house. It was evidenced by the amount of tracks crossing a sandy two-track that the birds were scratching for acorns in a specific woodlot and then crossing into a standing beanfield. Further proof of that came when I walked up on a flock of hens and poults doing just that after my first hunt. The next time I had a few hours to hunt, I moved a blind right on top of the spot and put out a single feeding hen decoy. All fall birds get territorial over their feeding areas, and a single hen cutting in line at the buffet tends to get them fired up. With everything in place, I started yelping aggressively every 10 minutes or so. Ninety minutes later, I heard a bird respond. And then another. A quick peek out the side window of my blind revealed several hens strutting in. Yes, they were strutting and they were hens. It’s something I see a lot in the fall, and it’s an awesome display of lady dominance. The birds held up just shy of my decoy by about five yards and started yapping away. I tried to get them to commit with more aggressive calling but they wouldn’t for some reason, perhaps because they didn’t like the blind. 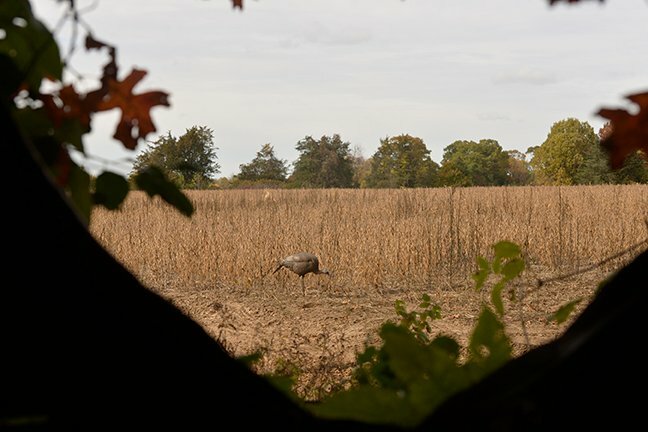 After a few minutes of back-and-forth turkey talk, they started picking their way through the beans in front of my blind. Before they foraged their way out of range, one of their members caught a load of No. 5s in the skull and ensured that we’ll have some bacon-wrapped turkey breast on the grill before winter. If you’re sitting on a fall turkey tag and are baffled about how to fill it, scout for fresh sign. Where the birds are feeding today, they’ll be tomorrow. Once you identify the best groceries, get in with a single feeding hen decoy and start calling. Eventually the flock will get close enough, and once it does, you’ll realize that birds in October are nearly as fun as they are in April.